I've gathered together a group of girlfriends and we'll be heading to the local theater for a mom's night out to watch Mom's Night Out! While the movie, certainly, strikes a rather significant chord of camaraderie with all mommas who desperately need to exhale, it has a special appeal for those of us who homeschool. As you'll see in this short trailer, the co-writer/director was homeschooled. He credits his mom for pulling him out of a traditional school setting in order to invest in his talents and cultivate his natural bents. He's a movie director today, because of a mom who recognized the need for passion-directed learning. As homeschool mommas, we have such a unique opportunity to nurture life-long strengths in our kids...something that would be difficult to do if they were in a brick box somewhere pushing papers around for six to eight hours a day. We need to embrace that opportunity and create a homeschooling environment that is different from the status quo. As a self-proclaimed book nerd, I'd absolutely agree that book learnin' is needed! But, it should be woven together with life-learnin' and love-learnin' and laugh-learnin' for a more well-rounded education. While my children may not necessarily be autodidactic, they all are passion-driven learners. And isn't that the way every child is from birth? No one has to teach a toddler to be curious or a preschooler to ask "WHY?" A passion to learn is as natural for a child as breathing. But sadly, once they reach school age, so many inquisitive kids lose their zest for learning because of their brick-box environment, whether at home or away, drills it out of them. Our children need us to invest in their passions...to nurture their natural talents...to foster a love for their God-given bents. Admittedly, I am no expert. I just do what works for my kids. But, as they say, the proof is in the puddin'. I've been adhering to this simple formula-of-five all along, and it hasn't failed me yet! 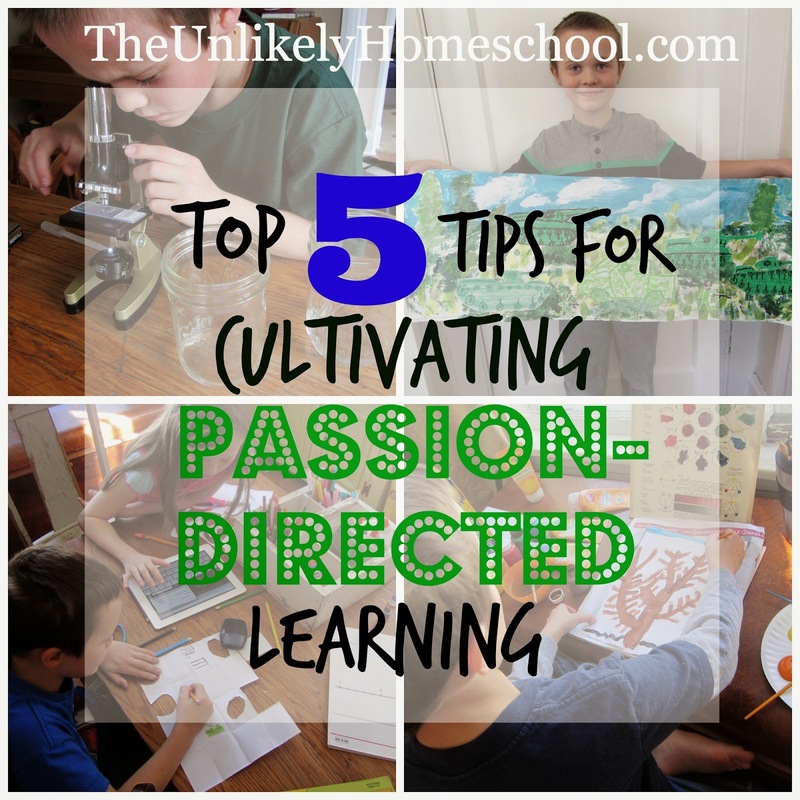 So, here they are...my To[ 5 tips for cultivating passion-directed learning in your home. Last summer while sitting on the sidelines at the park, I overheard two mothers chatting about the extra-curricular schedules of their daughters. Their weekly agendas included dance, basketball, softball, chess-team, acting classes, piano lessons, and a whole host of other "extras" designed to keep their girls busy, busy, busy. In and of themselves, none of these activities are necessarily bad. But, couple them with a half-dozen other "worthwhile" TO DOs, several hours watching TV or playing video games, and a minute-by-minute daily schedule, and you have the makings of a passion-less kid. In our insistence to wear "busyness" like a badge of honor, our society has stripped our children of the chance to become bored and thereby removed the potential for curiosity and exploration. They have no time to develop a passion because they have no time to need one. While I love a freshly-mopped floor just as much as the next mom, I recognize that during this season of my life I need to not only be OK with a mess, I need to welcome it. If my children live in constant fear of my reaction to a potential mess, they will never make one. With mess comes passion. With mess comes potential. I welcome mess because I know I am raising kids not clean floors. There will be plenty of time to have a house that is really clean...someday. For now, I'm content with "clean enough." In our attempts to make a "safe world" for our kids, we have created a padded environment so devoid of risk-taking that our children do not know how to fail. Risk-taking and failure are essential for passion-directed living...for greatness! If I'm constantly living in fear that my child might not succeed, might get hurt, might fail...or allow him/her to live with those fears...I am ensuring a life of mediocrity, a life destitute of passion. Don't get me wrong, I, certainly, value safety and common sense. But, as the quite passionate Albert Einstein once said, "A ship is always safe at the shore, but that is not what it is built for." At the risk of sounding counter-productive, I think saying "no" is essential for cultivating a passion. All too often, homeschoolers begin to mimic the "great" of other homeschoolers. This family is learning sign language together and that family is crafting historically accurate civil war costumes. It's easy to want to reenact their successes. And although most of those "good" things we see happening in the homes of our friends are, in fact, good, they are not always the best for our children. Don't sacrifice the best on the altar of the good. Learn to recognize your child's individual interests and gifts and be willing to make that your focus. In learning to say "no" to many things, you are affording yourself the time and energy to say "yes" to the best things for your kids. I'm a firm believer that a person's checkbook shows his/her priorities more than any other area of life. While I recognize that passion-directed learning doesn't always have to come with a hefty price tag, I also know that I would not bake bread, something I love to do and am passionate about, nearly as often if I had to knead the dough by hand every time without the assistance of my rather expensive KitchenAid mixer. The mixer was a gift from my mother-in-law who saw my passion and wanted to invest in it. She wisely assumed that I would want to bake more often if I had a tool that made the experience easier and more enjoyable. The wise purchase of a few quality tools-of-the-trade will enhance your child's overall learning experience and will probably help to provide a more-successful outcome of their efforts. With five children, each interested in many things, it's not always easy to foster passion-directed learning. But, by adhering to these five simple creeds, I know I am cultivating a lifetime of curiosity...a lifetime of exploration...a lifetime of learning. I am creating a homeschool that is as unique as each of my kids. I love your daughters song and that she taught herself. What wonderful moments we get to share with our children. Thanks for all the work you put into your blog. I have found much help and reassurance as I have come here this year. It's my first year on this journey with my 2nd and 4th grader and I wouldn't trade it for the world. I'm so glad your first year has been such a joy, Keri! Homeschooling is not always easy, but it is soooooo worth it. God bless you in the journey! My daughter is nine years old and has expressed an interest in learning how to play the ukulele. What channel(s) did your daughter use on YouTube to learn how to play? She watched several different ones but particularly this guy because he specifically addresses those who have NO ukelele experience. I like this. It can be challenging though. One of my teenagers has a great interest in computers/computer games and at best research on the computer. It is difficult to know to what extent to embrace this particularly when there seem to be relatively few other interests. That would be a challenging one. While I, too, would be concerned with too much screen time, it's also hard not to rule out the possibility that he/she might go into a computer-driven vocation. Found your blog on Hip Homeschool Moms. We have been mostly unschooling the last several years. I say mostly because we do use Time4Learning's high school courses too, but not daily. This last year my daughter has really been more involved in pursing her passions..art, animation, photography, and such. I was a little nervous because the teacher in me wanted to get back to more traditional learning, however, I know her learning style is meant for unschooling, and I see her progress. I just LOVE reading your blog! You are such an inspiration to be a wonderful mama and teacher. Thank you! And your daughter...WOW! She is adorable and talented! Thank you. She is such a gift to our family. That Einstein quote screams being put on a beautiful photograph and framed somewhere. In my house it would sit framed leaning against the wall for years until I finally throw up my hands and threaten to hang it myself. Don't you just love that quote?! I keep it tucked in the back of my mind. But, a frame would be even better. These five tips are profound for raising children, homeschooled or not. Thanks for reminding us. I found you on YouTube. Keep up the good work! Thanks. Glad you found me. Yes, I agree. Whether you homeschool or not, passion-directed learning is the way to go. NOT the only one! At this very moment, I have six baskets of folded laundry, a bin of toy cars, and five refrigerator-sized cardboard boxes sitting in my living room...none of which belong there! My house is rarely clean...but always clean enough. I try to remember that a house is clean...a home is lived in! As a homeschool mom, you have to cut yourself some slack. You and your kids are home all day when most kids and moms are off at school and work. That means that your house will most likely be more messy than most...but it will also be full of love and learning. I agree 100%! Last summer my daughter and her best friend were so bored, they decied to give a free, online, homeschool curriculum a try. They had a blast dressing up in their "uniforms," (plaid skirts and white shirts) heading to school to at one another's ther houses, and chatting about what they learned during their lunch break. Love it! I hope you took pictures of those uniforms. What are "color- coded drink bands?" She makes rubber band bracelets to fit the size of our drinking glasses. She makes them in all different colors and we use them to tell our glasses apart throughout the day. I was wondering in regard to project based learning and passion driven learning, do you plan this into your homeschool schedule or is this something she has to do outside of those times? If you plan it into her schedule how much time during the day would you give her a day/week? Her independent projects are not scheduled into her day in any particular way. She has a deadline of sorts and is expected to work on it a little bit each day, but when and how is left up to her. That's part of growing her towards independent learning...she is learning to manage her own time. The passion-directed projects are usually something I work into our day. If it is something science related, we do it during science. Since science is something that is already penciled into our schedule, I don't have to change our schedule at all. We just work on that project for the day at that time.